This first step up the metaphorical ladder to cloud storage is beginning the process of digitizing your documents or files. Although it can be a daunting task to think about when you’re staring at a filing cabinet full of folders, there are certain tricks that can make this process pretty effortless. Once you have found a scanner you like, we suggest that you customize a few settings to optimize the efficiency and quality. 1. Change the color setting to black and white. Sometimes if a scanner is set to color, it will bring over a yellow or orange haze in the background for regular black and white documents. In addition, it will significantly increase the size of the output file, making it much slower to open and upload to the cloud. 2. Set the D.P.I. (Dots Per Inch) to about 300 to 400. This is the is the standard setting for most scanners, but we recommend that you double check. This is another great way to optimize the size of your digital files so that the upload process is quick and reliable. 3. 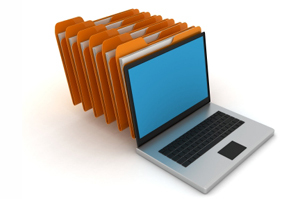 Create a folder on your desktop or hard drive that allows you to upload and locate the files quickly and easily. Often times, people upload and download files to unknown destinations, which can add unnecessary time to the process. Whether you are emailing your digital documents, storing them on a hard drive, or even uploading them to a virtual data room, you want to ensure that you have the most efficient settings possible for your scanner. These quick tips can help save you precious time and unneeded stress for a process that will cut costs, increase communication, and tighten security for your business.